The size of an animal’s home range is strongly influenced by the resources available within it. In productive, resource-rich habitats sufficient resources are obtainable within a smaller area, and for many species, home ranges are smaller in resource-rich habitats than in habitats with lower resource abundance. Location data on 14 male and 27 female echidnas (Tachyglossus aculeatus) fitted with tracking transmitters, in the southern midlands of Tasmania, were used to test the influence of habitat type on home-range size. We hypothesised that as woodland should offer more shelter, food resources and refuges than pasture, echidnas living in woodland would have smaller home ranges than those living in pasture areas. We found significant differences between the sexes. Male echidnas had a significantly larger mean home range than females and a quite different relationship between home-range size and habitat type from females. There was no relationship between the proportion of woodland within male home ranges and home-range size whereas female echidnas had a highly significant negative relationship. 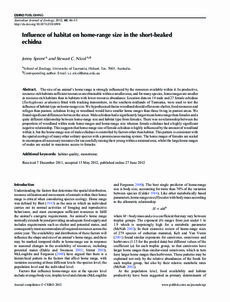 This suggests that home-range size of female echidnas is highly influenced by the amount of woodland within it, but the home-range size of male echidnas is controlled by factors other than habitat. This pattern is consistent with the spatial ecology of many other solitary species with a promiscuous mating system. The home ranges of females are scaled to encompass all necessary resources for successfully raising their young within a minimal area, whilst the large home ranges of males are scaled to maximise access to females.